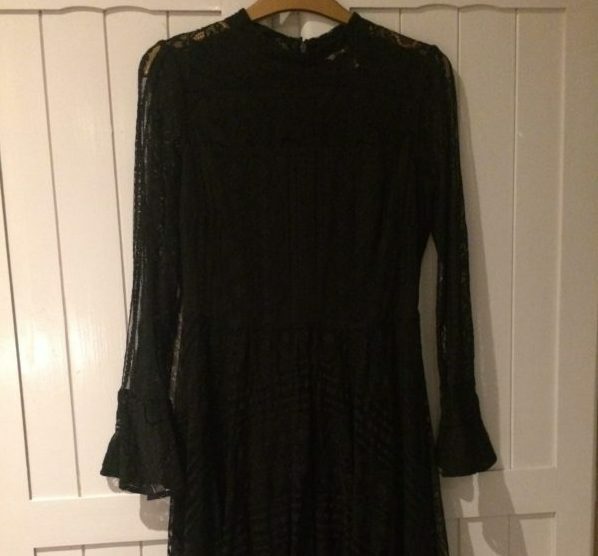 To the mamas in the house: would you wear this dress down the pub? This Dolce & Gabanna meets granny-going-to-a-funeral dress to a casual, school parents' social? I did. My decision was inspired by two things: Zoe Kravitz's latest interview in Vogue and one of my current life coaching client's goals. And boy, did this resonate with me. Sure, she's got youth and beauty (and fame), on her side but why on earth shouldn't this apply to me? To anyone? To all of us? My beautiful client on the other hand, was exploring new and different ways to feel self-confident. And clothes - our "look" - is a very important strand of how we choose to express ourselves. So she had challenged herself several times over the course of the past two weeks to experiment with this: by not wearing any make-up, by asking someone else to choose her clothing for her for a couple of days, by wearing something she would normally wear to a party as day wear, by enjoying showing off her curves. Pretty brave, eh? And the result was astounding. A total disengagement from social peer pressure and a wholehearted embrace of what made her feel good, inside and out. Which also resonated with me - after all, if I was able to successfully support and encourage a client to stretch their self-imposed limits, surely I could do the same for myself? So I wore the dress. In an "inappropriate" setting. And I felt awesome. And guess what? I know that I (quietly) inspired others to do the same. It wasn't a big deal in the grand scheme of things. But at the same time it was huge: I chose to express myself authentically when it wasn't necessarily the done thing. Courage. Confidence. Which comes first? Both lead to one another. And both are cornerstones of my life coaching business: I am passionate about supporting women to regain the confidence and courage to remember who they really are, rather than who society or others think they should be. Last week, I applied my mission statement back to myself. How can you channel some courage and self-confidence today? How can you make a 'bold choice, unapologetically'? Which self-imposed rules are you ready to break? Let me know in the comments below! Are you fulfilling your greatest potential, mama? Are you getting paid to do what you love whilst parenting in a calm and positive way? Are you feeling happy and fulfilled both at work and at home? Because you deserve to! Book a complimentary discovery session with me on skype and we can explore taking concrete steps towards creating a life in which you feel motivated and in control once more!